Attached red skirt has elastic waistband and printed poodle design w/ sequin "leash"
The 50s always seem like a more wholesome, innocent time. It seems as though people were more connected and had more clean fun with their friends. This cute retro girl’s costume comes with everything your little one needs to travel back in time this Halloween. 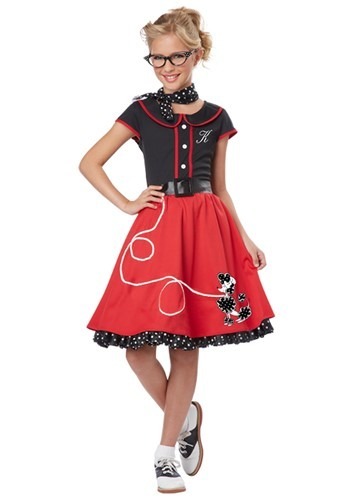 The 100% polyester knit dress has a black bodice with red trim and white decorative buttons on the front. The attached red skirt has an elastic waistband for a comfortable fit and it also has a printed poodle design with a sequin leash to add a little modern bling to the look. Also included is a black petticoat with polka dot trim. The petticoat also has an elastic waistband. The details are what really set this costume apart from the other 50s costumes out there. The faux leather belt has a plastic buckle and an adjustable Velcro strap. The black scarf has white polka dots and a Velcro fastener to keep it in place all night long. Top it off with the white foam monogram letters with adhesive to give it a personal touch. Add a pair of bobby socks and saddle shoes for a complete look!